Sparkle, Sparkle in My Card! This﻿ card was made for several challenges including one that required sparkle so I wanted the sparkle to really shine in the photo which is often hard to do. In order to have a lot of sparkle that could be seen, I glittered a strip of White shimmery CS with a lot of crystal glitter to make sure I had that shine come across. 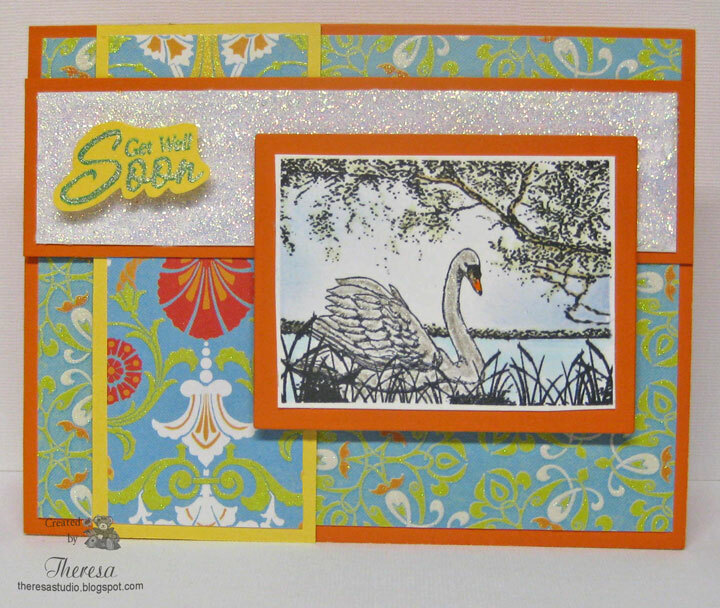 I also used Glitter DP and used a Sakura Clear Star pen to add shimmer to the swan and trees in the image and the sentiment. (Can you see that?) I think this card shines bright with enough sparkle! I used a sketch from Crazy 4 Challenge and colors from The Play Date Cafe challenge in designing my card. Stamps: Mark Finest Papers "Floating Along" stamp set that I won during the recent release. Speedy the Cat's Friends: Make it sparkle. 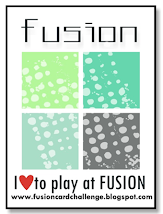 The Play Date Cafe: Colors shown on graphic below. 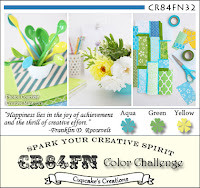 Crazy 4 Challenges: Sketch challenge shown below. One Stop Challenge: Get Well Soon...that is the exact sentiment that I used. Sweet Stamping Challenge: Use something old, something new. The stamps that I used are new and first time I used. The old is DCWV DP and glitter that I have had for sometime. Hardly ever use glitter. AnnaBelle Stamps Blog has a great sketch challenge this week and it ends soon. I thought this was open until Thursday but just saw it closes in 55 minutes from now. Glad I checked again. Check their blog to find out about more changes in challenges. I like the colors that I chose for this....began with the CS which is a soft Aqua...and found the ribbon and then a scrap of Yellow CS that matched for the focus image. I used green ink to stamp on White CS. 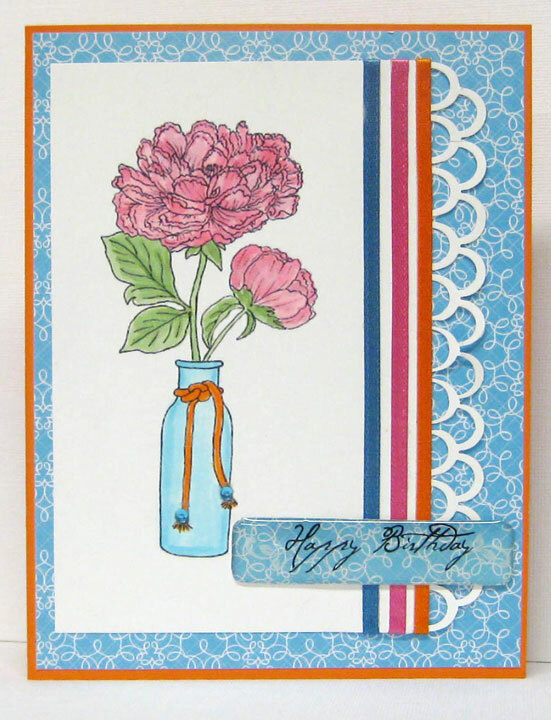 I used the Aqua for the card base, added a white mat and then a embossed mat of the Aqua. 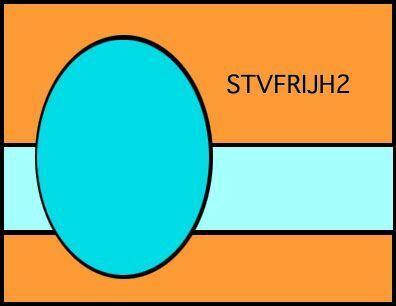 Added the ribbon to the image and attached. Finished with 6 pearls. Stamps: AnnaBelle "All Things Grow"
Note about the butterfly: I stamped the image in black on yellow CS Scrap. I cut the butterfly out and then stamped the image again on the back side of the butterfly. Easy to do with with the clear stamp. I folded it in half and attached with dimensional to get a 3D look of a butterfly in flight. I drew the antennae with a marker because they were too small to cut out. Alphabet Challenge Blog: H is for half dozen. Used 6 pearls on my card. Flutter By Wednesdays: Open challenge. Butterfly is an AnnaBelle stamp. 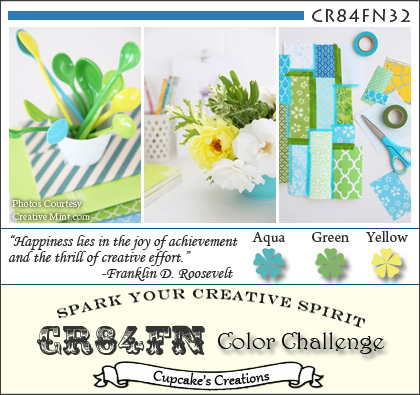 CR84FN: Color challenge is Aqua, Green and Yellow. It is almost July and we will soon be celebrating the 4th. Time to pull out the Red, White and Blue for some cards. Thought the sketch from Cute Card Thursday was perfect for this card. 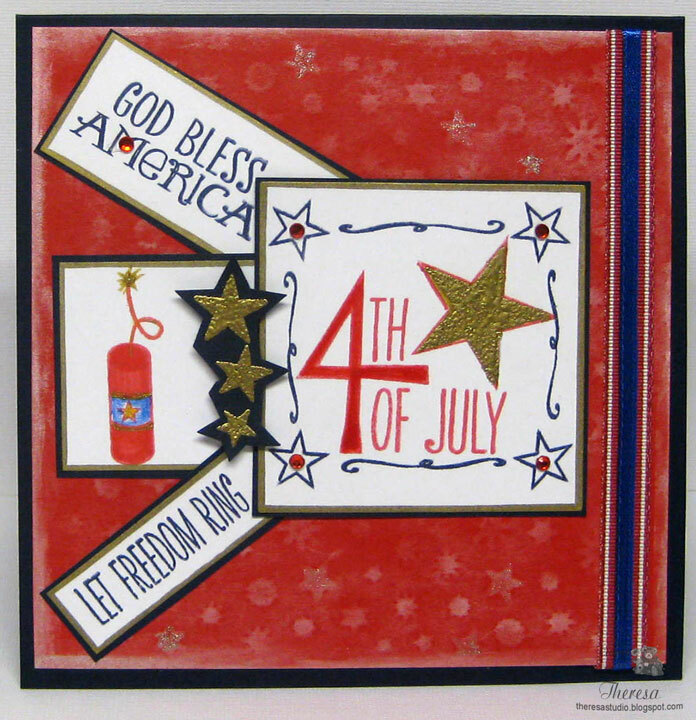 I used stamps all from Verve's "American Hero" that I stamped on White CS and layered in Navy CS.....used a mat of Red CS that I embossed with stars and highlighted with Platinum Ink and all went together on a Navy Card base. Used Versamark and Gold EP on some of the stars that I stamped and finished with some shiny red bling. I put on a double layer of ribbon for some patriotic stripes. Cards for Men: Challenge is Stars. Craft Your Passion: Seeing red....use color red on your project. Cooking It Up with Katie: Use colors of your Flag. Sentimental Sunday: Use the colors of your national flag. What are your plans for the 4th if you celebrate the holiday? ﻿ I bought this LOTV Stamp when it was released this spring and have been anxious to ink it up. I had planned to use it for Father's Day but that plan did not work out so I am now going to use for Lili of The Valley's Sketch challenge this week in a birthday card. I stamped it on white CS and colored with Copics and sponged the background. I cut the image with a circle die and matted on another circle. Cut 3 rectangles of BasicGrey DP that I attached to Cranberry square card base...seldom make square cards but this cried to be square. Stitched on a wide lime green ribbon and adhered the image. Finished with a Birthday tag with ribbon. 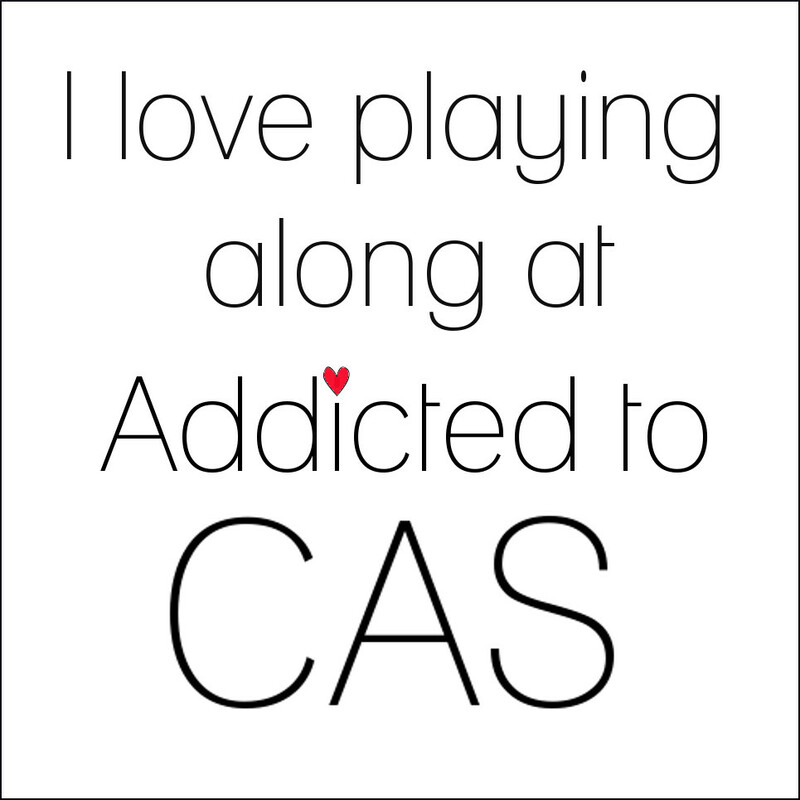 C.R.A.F.T. 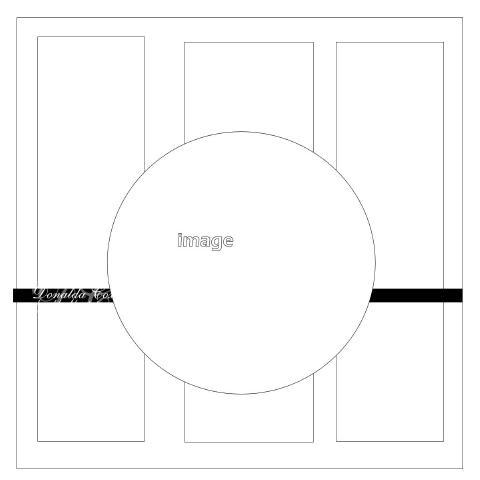 Challenge: Recipe challenge: 1 Tag, 2 Circles, 3 Rectangles or Squares. This sketch worked well with this recipe. BasicGrey Challenges: Use stitching. Stitching is not one of my favorite to do but it worked well with my ribbon. Crafts and Me: Theme is Birthday Cards. Daddy Bear's birthday is not until October so for once I am ahead of the game. And he will not remember this card when I give it to him then. 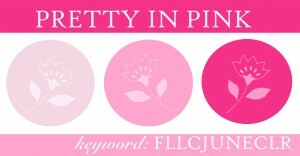 Flourishes Bring Back Beauty challenge is Beauty in the Spotlight! You are to use the Spotlight technique — the goal is to make just part of your image POP. 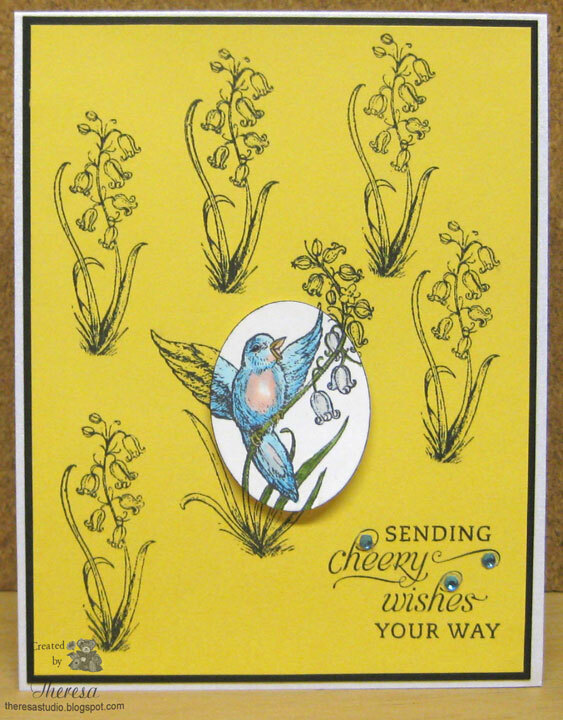 I selected "Spring has Sprung" stamps for my card and put the spotlight on the blue bird. I began by stamping some Lily of the Valley images, sentiment, and then my focal image in Memento Tuxedo Black on yellow CS. I then stamped my spotlight on white CS and colored with Copics B000, 01,24, R20, and C1. 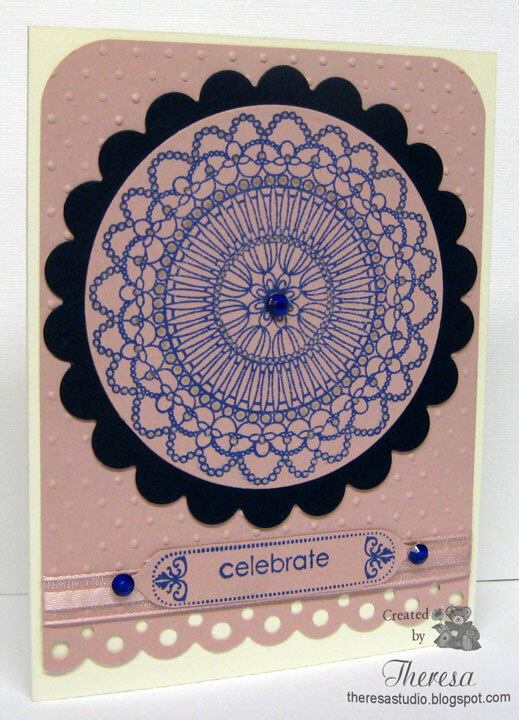 I cut the spotlight with Nesties Oval die amd attached on the card. I used a card base of Shimmery White CS , added a black mat and attached the image. Finished with some blue rhinestones on the sentiment. What fun to swing on a sunny day and it is even "funner" with a pinwheel! 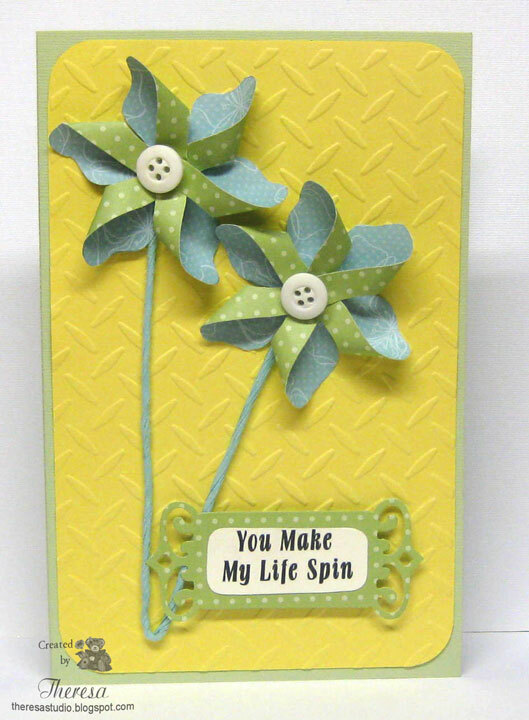 I made a smaller version of a pinwheel that I made last week and used on this card for a challenge at All That Scraps that Patti G told me about. I used "Nora on a Swing" from C.C. Designs for my focus. Stamped her with Memento Rich Cocoa and colored with Copics and Sakura Clear Star on the wings. Sponged the sky with Memento Summer Sky. Framed the image in green satin ribbon and placed on Yellow card base. Added the pinwheel (unknown DP) with button center and twisted twine for the stick. Handwrote the sentiment and cut with Nesties Label 4. Finished with a ribbon flower. All That Scraps Wednesday Challenge: Add pinwheel to a project. 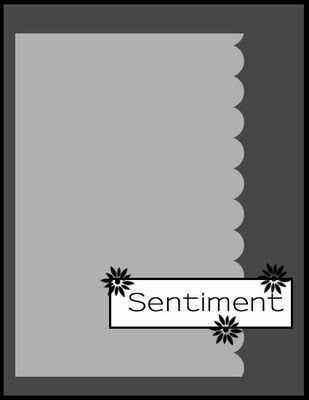 Really Reasonable Ribbon: Use handwritten sentiment and ribbon. Yes I know that I hardly ever attempt to do vintage style cards but I am giving it another try. And I emphasize the word TRY as I am not sure if this qualifies to be called vintage. When I showed this to my DH, he said that it doesn't look like something you would do.....his way of not being negative. 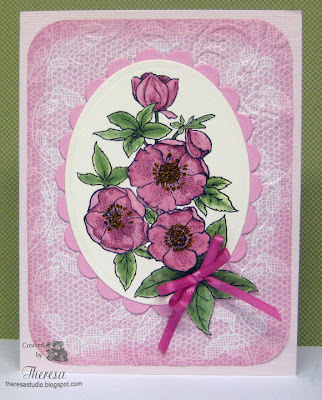 I made this card for the challenge at Sugar Creek Hollow to use PURPLE, KRAFT & BLACK to create a vintage, shabby chic or primitive inspired card . Not sure what category this falls under. But I tried using the elements of distressing, vintage look stamps, and some wrinkled seam binding for the bow. 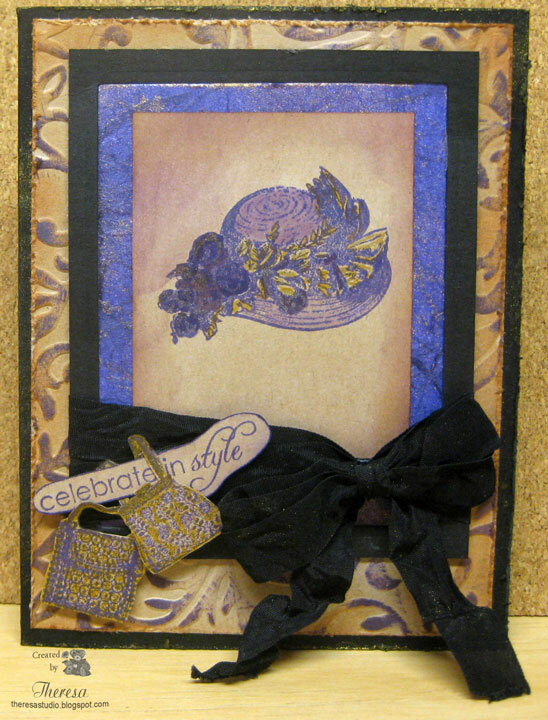 Used distress ink and shimmer spritz to age the mat of purple and embossed mat of kraft. Distressed the edges too. Maybe I have too much black?? Used Critter Sketch for layout. 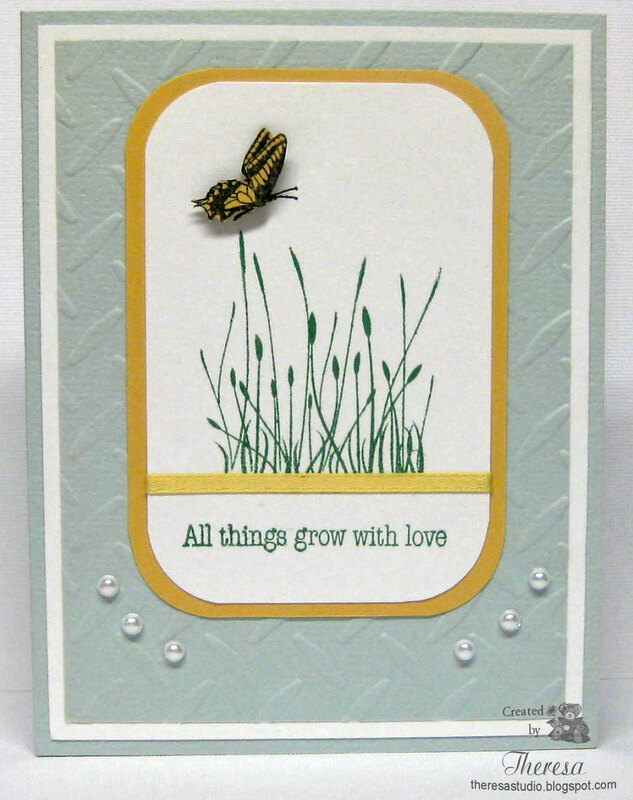 This one is for you, Patti P.
Paper Players has a great Clean and Simple Sketch this week and I teamed it up with a color challenge from BasicGrey Challenges and came up with this card that I added a butterfly to for "something with wings". 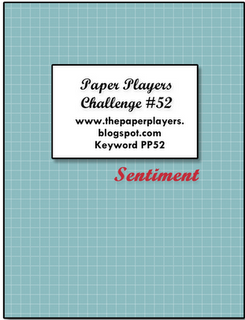 Paper Players : Challenge 52 Sketch shown below. BasicGrey Challenge: Color combo of Hot Pink, Lime Green, Brown. Used DP from Olivia...scraps of green paper is also from BasicGrey but not sure which paper pack. Sweet Stampin' Challenge: Things with wings. Butterfly stamped on white CS with rose bud ink and sponged with pear tart ink. Added Glaze to dots. 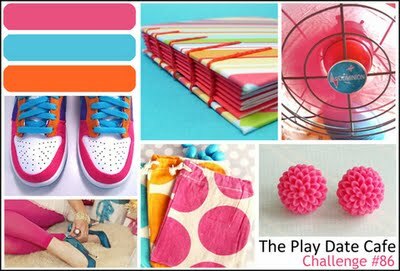 Little Darlings Challenges: Use fave color combo. Another one in Pink and Green. Stamps: Layers of Colors "Flutterescent"
This card covers a couple of challenges...one a sketch and one a color combo. I made 2 pinwheels using an unknown double side DP. Added buttons from stash to the centers and used wired raffia for my sticks. Placed this atop a embossed mat of GKD Yellow CS and then onto card base of Bazzill Green CS. EF is CB Diamond Plate. Used a fancy tag die for my computer generated sentiment. This week has spun by! Do You Know Today is "National Pink Day"? I have had several posts today...some that I had pre-scheduled....but now I have another one with some pink flowers ....to celebrate "Pink Day". I have done a lot of cards lately with pink ...guess the color has grown on me as I own very little pink. 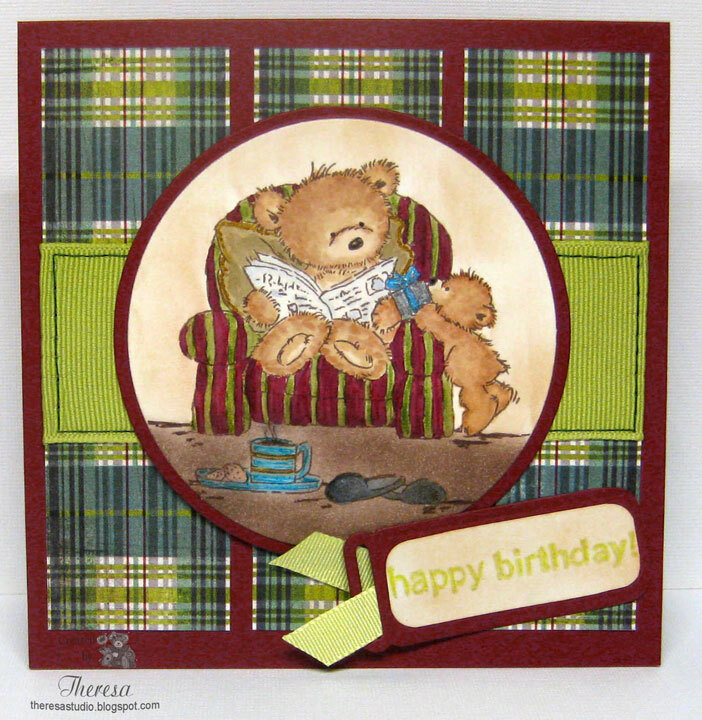 I used a sketch from Creatalicious and used a GKD stamp set to make this card for a few challenges including one calling to use pretty paper and two for paper piecing. I thought the DP that I used to paper piece the vase looked like a pattern from a porcelain vase. 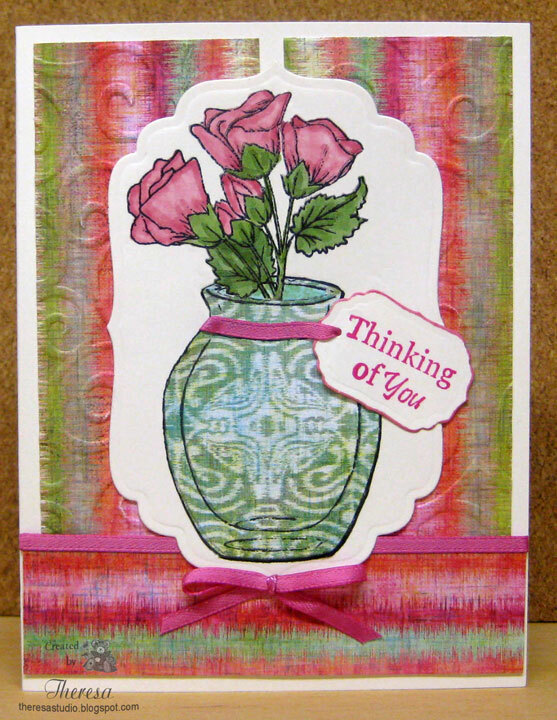 Stamped the vase on ivory CS and masked it and then stamped the flowers which I colored with copics. of course I also stmaped on the DP and cut out for my image. 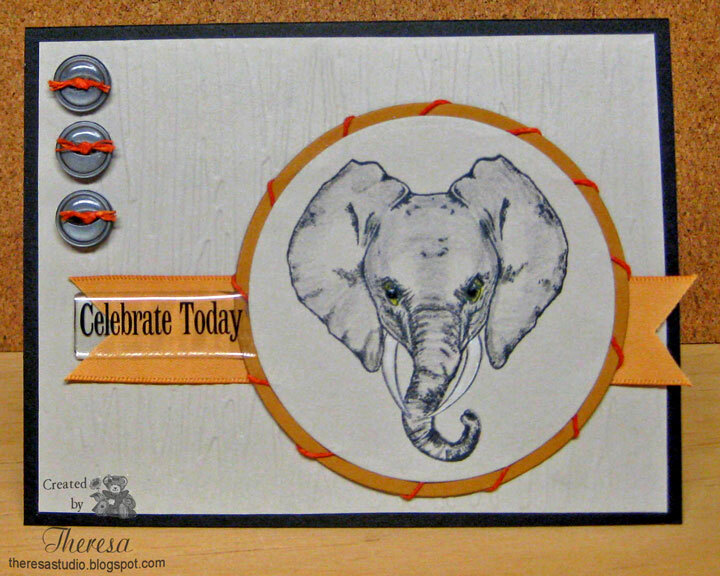 Used more DP to do for embossed mats and placed all on a ivory card base. Finished with ribbon, bow, and sentiment that I "tied" to the vase. I like the way I engineered the patterns for my designs. 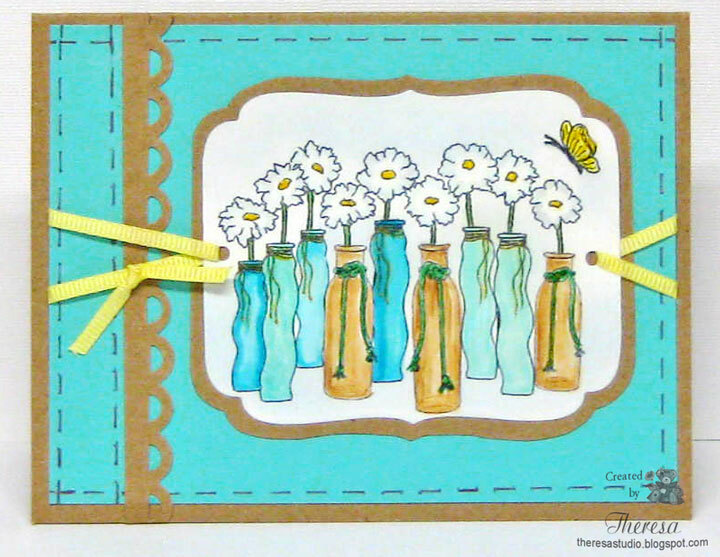 Stamp Something: This week the challenge is to use some pretty paper! Use a lot, use a little. I have used papers from Basic Grey "Sweet Threads"
Stamp TV: For Mix It Up Monday challenge, use Paper Piecing on your card. 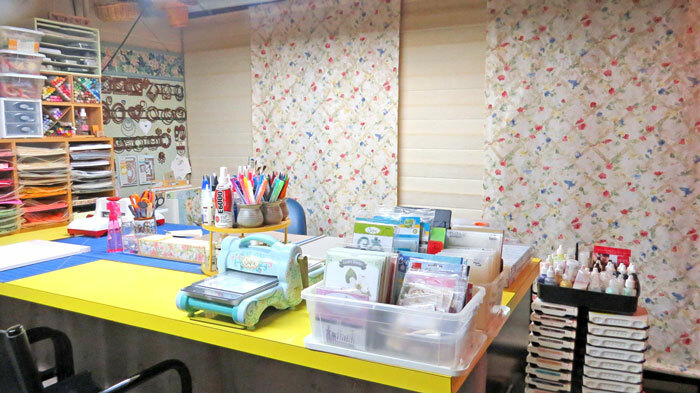 Craft Your Passion: Challenge is paper piecing. Creatalicious: This Month's challenge is a sketch shown on right. Lil Darling: Use fave color combo. BasicGrey Challenges: Use Hot Pink, Lime Green, and Kraft/Brown. All colors are in The "Sweet Threads" paper I used. How much do you like pink ? 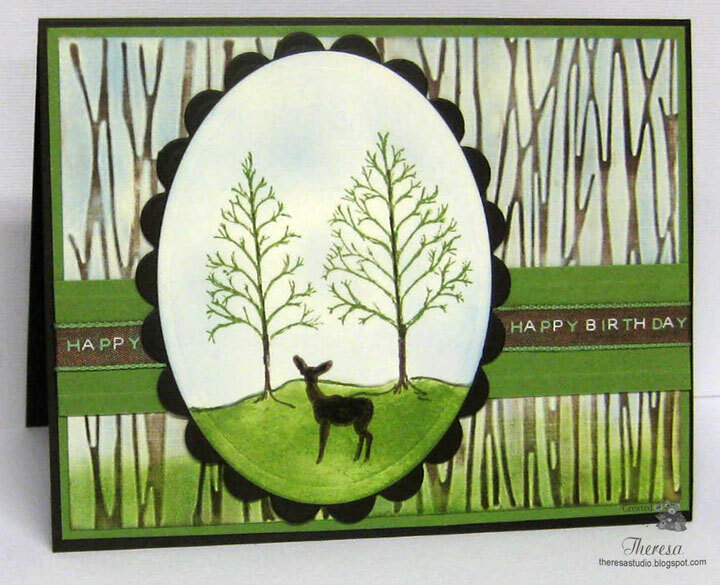 I thought I'd make a masculine birthday card for this Friday STV Challenge from Jennie- to use the sketch shown with a theme of trees. I used stamps from GKD set "Life is Good" by Theresa. Made my background by embossing Ivory CS with CB EF Forest Branches and sponged with Memento Summer Sky, Bamboo Leaves, and Rich Cocoa inks, the same colors I used to stamp and color the images. All CS is from GKD and ribbon is by Martha Stewart. 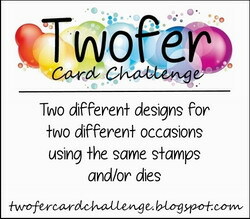 Speedy the Cat's Friends Challenge is from Lori this week and she wants us to use buttons on our card. I have plenty of buttons in my collection so this an easy one to do. I combined this with a sketch challenge from Sweet Sunday that has a spot for buttons. I stamped an Elephant image from Mark's Finest papers in black ink on grey paper and did shading in white, grey and black pencils. Easy way to make this stamp do all the work. Cut it out with a circle die and placed on a ring of orange CS that I wrapped with orange twine. Use a card base of black CS and an embossed mat of the grey CS. Added ribbon, buttons with twine and a sentiment sticker to finish. Speedy the Cat: Use one or more buttons....added 3 grey buttons. 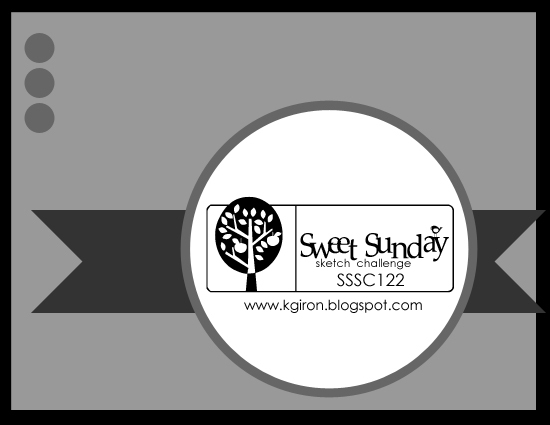 Sweet Sunday Sketch: Sketch 122 shown below. 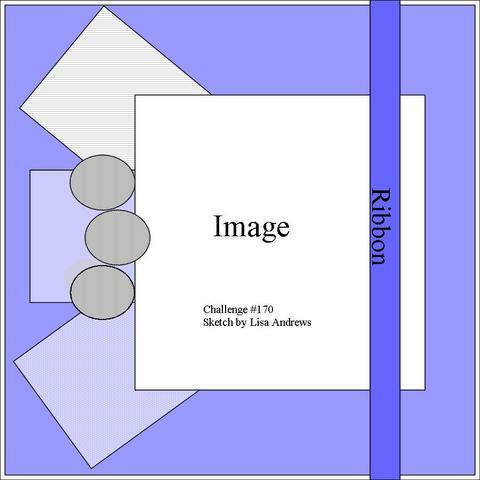 Crazy 4 Challenge: Add twine, floss, or string. One Stop Craft: Use stickers on project. 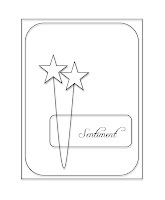 Used clear epoxy sentiment sticker. 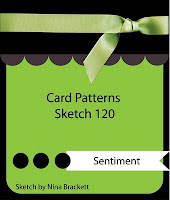 Tuesday Throwdown: Make masculine card. Scrap Creations: Make a project with animal or jungle theme. I colored the image with Copics B000, Bg01,05,07,10,11,15, C1, E53,55,59, and YG67 and added some highlights with Sakura Glaze Pens in Yellow and Green and Atyou Spica Pen in gold. Cut this out with Nesties Labels 4 and matted on Kraft CS. Used sketch from Truly Scrumptious for my layout. Papers from stash. Did some faux stitching to finish . Magic In The Air: See inspiration photo. Digi Doodle Shop's Best: Theme is Stitching. Crafts and Me: Use some kind of stitching. I realized as I posted this that I left off my bling and sentiment...OOPS! Maybe will edit later with corrected photo. THE CHALLENGE IS: MIM also known as More Is More. HERE’S HOW TO PLAY: Make a creation and then make a more spiced up version of your first creation. You must use Flourishes stamps and link up to the Christmas Spirit Challenge 14 thread in the Flourishes Contests and Challenges Thread at SCS. 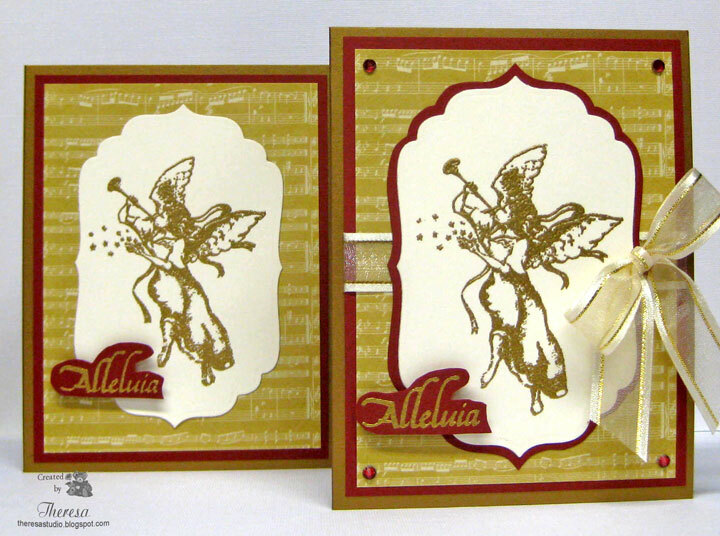 For my first version of my card, I used Flourishes " Allelulia Angel" set for my stamps. I used Versamark to stamp the angel and heat embossed with Gold EP and then cut the image with Labels 4. I place this on a mat of Webster Pages "Santa and Sweet Season" DP and a mat of Cranberry CS. I used gold metallic CS as base. 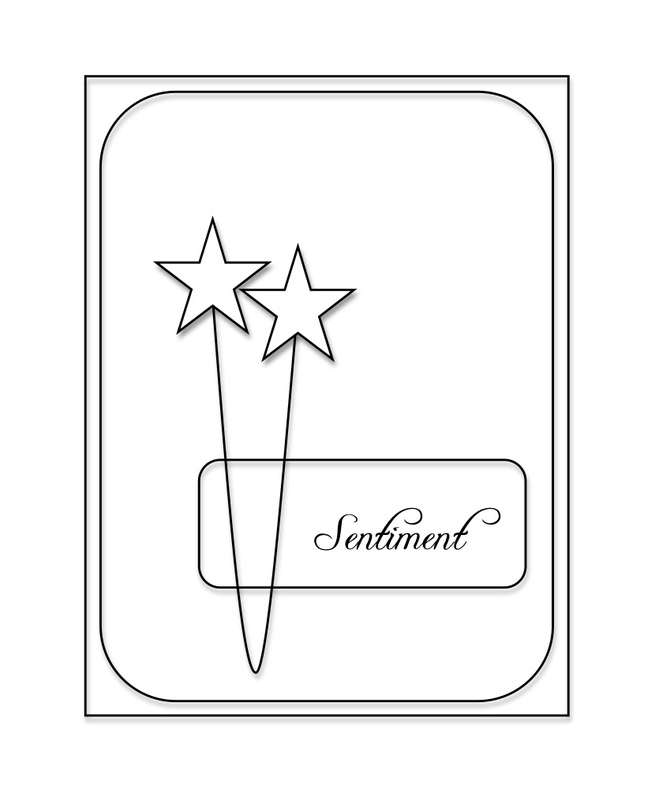 Attached the sentiment that was heat embossed in gold on the Cranberry CS with pop up dots. 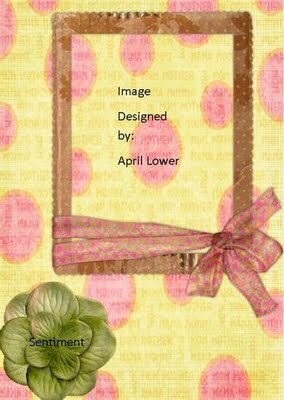 For my "More is More" version, I added a mat of cranberry CS cut with Labels 4 to make the focal image pop. Added organza ribbon with bow and cranberry bling to the corners to really dress up the card. 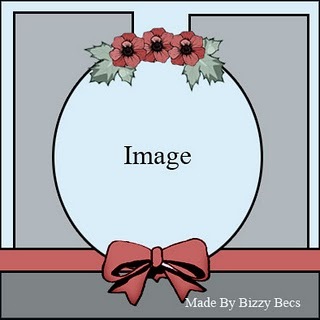 Craftyhazelnut's Christmas Challenges: Include an Angel or Fairy on your card. Used the angel on my entry. What better way to spend a summer day than swinging on the front porch with a glass of lemonade? So stop on by. I have a glass of cool lemonade waiting on the porch railing. I made this card with a stamp "Pleasant Porch" that I won from The Pixie Cottage. Love this stamp. 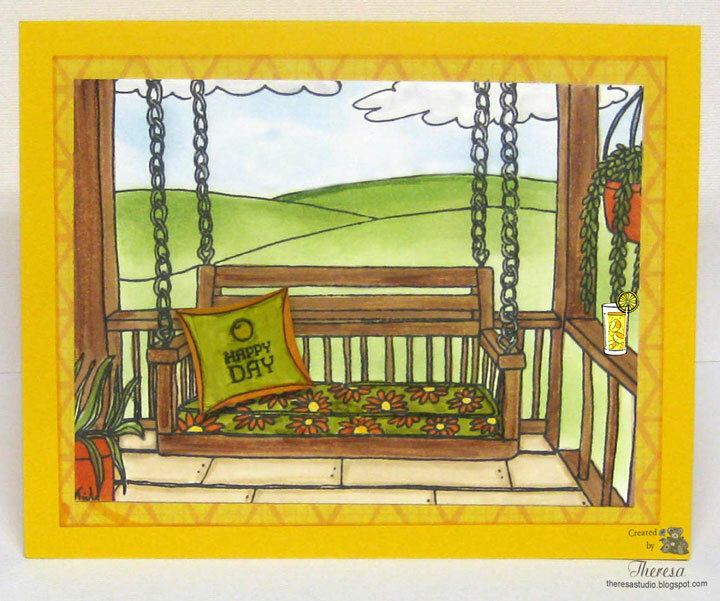 Colored the image with copics and Jelli-Pens on the chains and sponged the sky and hillside with Momento Inks. Added a pillow that I drew, cut out and added the sentiment from a Flourishes stamp set. Papers are from stash. The Pixie Cottage: Our theme this week is "Grab A Glass of Lemonade" The theme we are looking for is something yellow or lemony or just simply something to cool you down on one of these hot summer days! For Fun Challenges: Theme is Summer Fun. 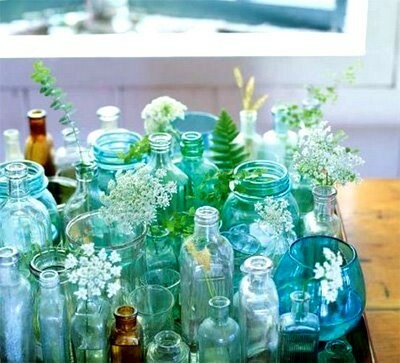 Secret Crafter Saturday Challenge: Something from the house (images containing household items). Pillow and glass from the house. Sentimental Sunday: Celebrate Summer. Sentiment is on pillow. Bearly Mine: Summer is here. Sometimes a paper can inspire a card's design. 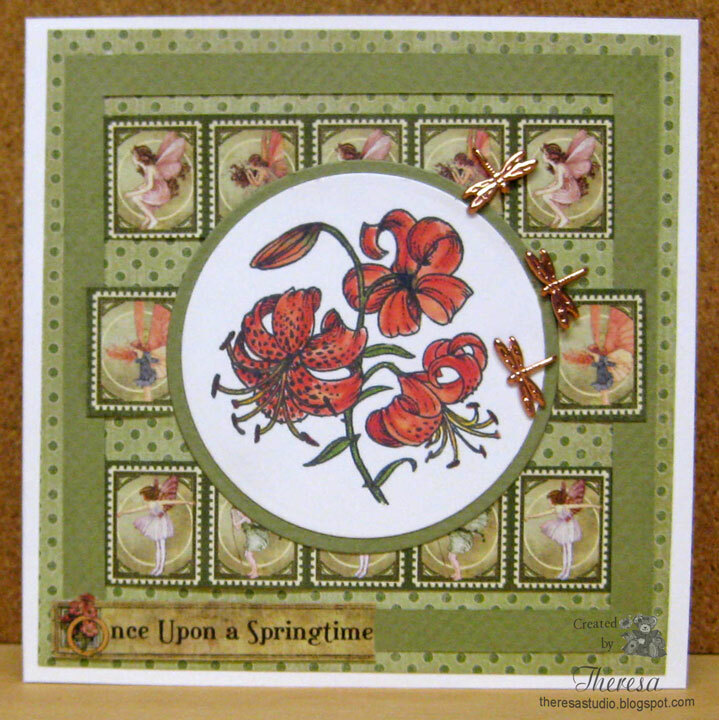 I was trying to decide what to make for Flourishes Timeless Tuesday Challenge which is to use at least one circle and one square shape into a card. 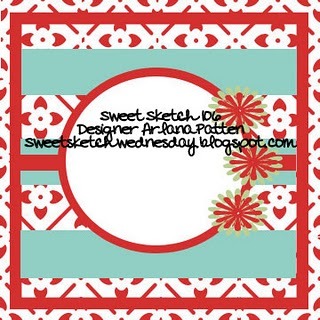 I had decided to use a layout from Sweet Sketch Wednesday that had circle and square elements. And then I came across this double sided paper and thought it would set off the tiger lily that I already had colored. I used the designs in the DP for my stripes as well as for a sentiment. Thus my card evolved. Ink: Memento Tuxedo Black and Copics. Timeless Tuesday #122: I used circles and made my card square with a square frame inset. Sweet Sketch Wednesday: Sketch 106...first time to do this challenge. 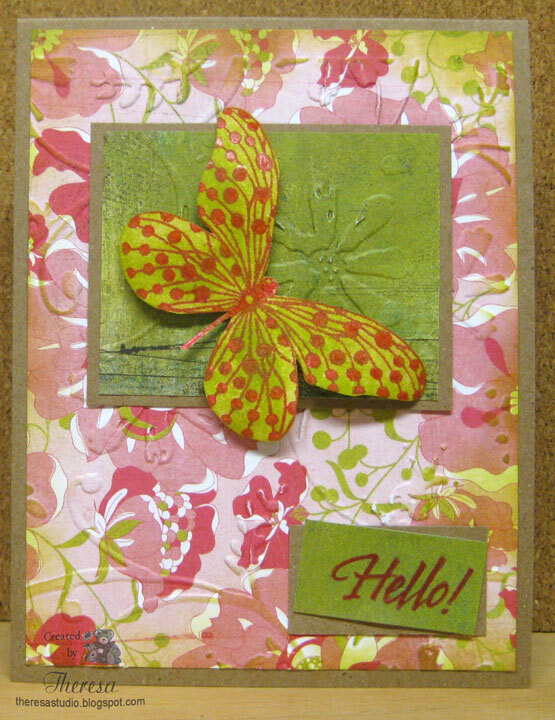 Flutter By Wednesday's: Use the colors pink, orange and green on your creations. Just happen to have these colors in my card and have lots of Fairies. I am combining several challenges to create this project. At There's Magic in the Air, Gloria wants us to pick two of these elements: Flowers, Ribbons, Pearls/Gem and/or die cut and use them on your project in any way. 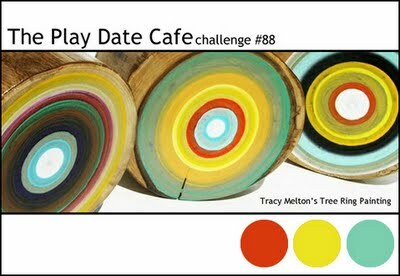 Play Date Cafe wants us to use colors of Hollyhock...Sky Blue...Orange. There's Magic in the Air: Used Blue gems(on the end of strings on vase) and ribbon. One Stop Craft Challenge: Use sticker. My sentiment is a clear epoxy sentiment. Kaboodle Doodles Challenge: Make a project using flowers as the main focus. Delightful Challenges: Anything Goes. Simple enough. Clean & Simple: Use sketch shown on right for my layout. When my husband retired 8 years ago, I told him that he should buy a FUN car since he had driven company cars for many years.....not much fun driving them. But little did I know just how much FUN that he would buy! 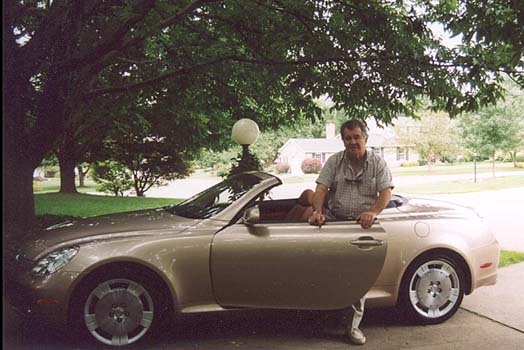 He came home sporting a Lexus SC 430 in Egyptian Sand...that's about as much fun as you can find in a car! And he has been driving it ever since. When I saw this LOTV stamp of a teddy bear in a sports car, I thought immediately of my "Daddy Bear" tooling around in his sports car and had to have this stamp. 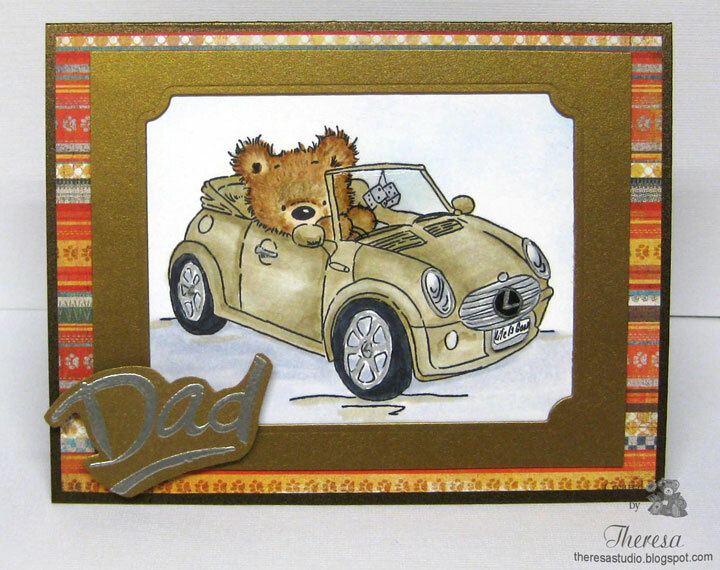 I have colored it up to resemble his little convertible and made this surprise card for Father's Day. That was hard to do since he is always checking what I am doing in my studio. By the way, the front license plate reads "Life Is Good", his words to live by. Stamp: Lili of the Valley "Mini Bear"
Cupcake Craft Challenges: Theme is boy oh boy...do Father's Day project. Little Red Wagon: For Dad. Wags 'n' Whiskers: One for the Boys. Stamptacular Sunday: Fun in the Sun. What's more fun than driving a convertible in the sun? Lili of the Valley: Bring on the Music...may be stretching this a bit....but my card was inspired by the song "Drive My Car". May not qualify for this challenge but was fun to use this LOTV stamp. Listen to the song by the beatles: Click here. Happy Father's Day to my DH and to all the wonderful fathers out there. Happy Father's Day to My King ! My husband is the King of our Home and the Ruler of our Domain (at least he thinks so). I made this card to reinforce that thought on his special day. 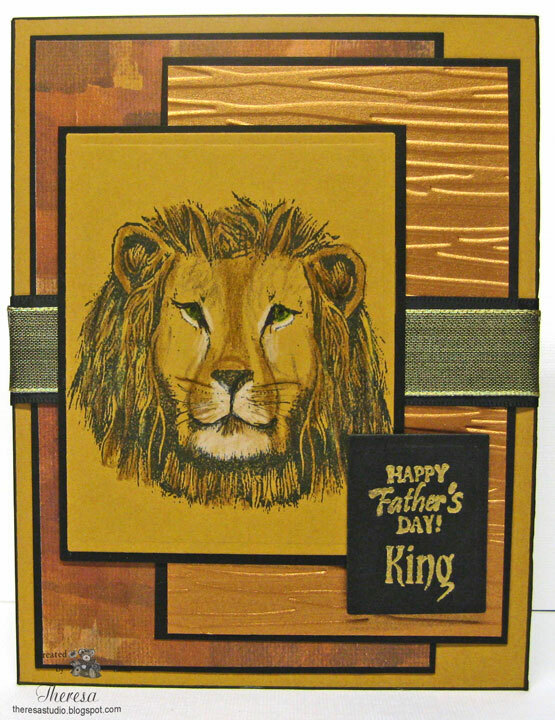 I stamped the Lion on gold CS with black ink and then shaded with pencils to bring out the details. No copics or markers involved. I let the color of the CS do most of the work. So simple but effective. Used the same gold CS as the card base and layered with a mat of Pattern DP and embossed Metallic Copper mat. All layers were matted with black CS. Added black satin ribbon layered with metallic gold organza ribbon. Finished with sentiment gold embossed on black CS. Assembled this following Sketch 222. shown lower left. 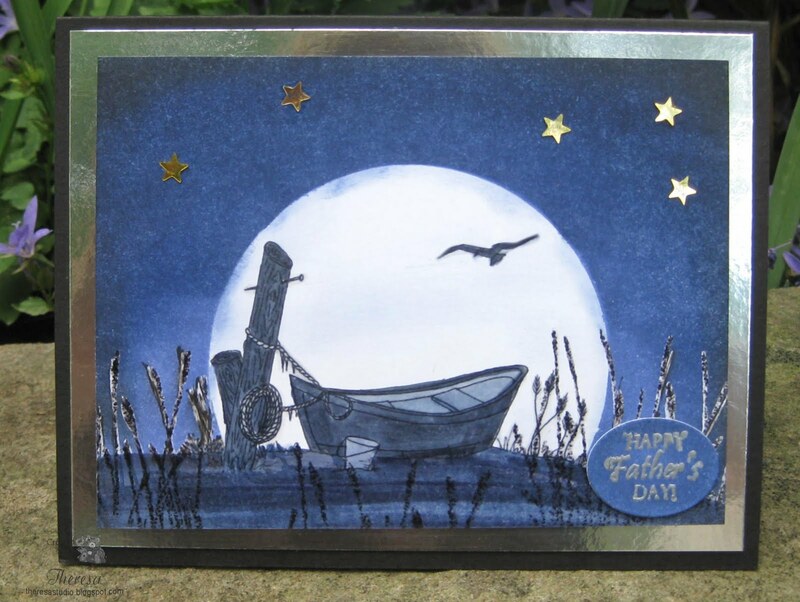 Sentimental Sunday: Father's Day or Masculine Card. 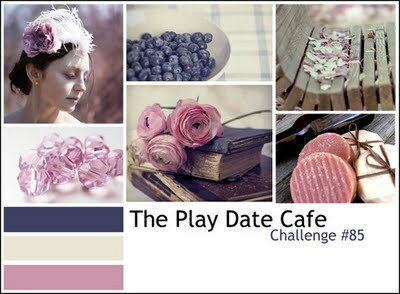 I enjoy playing the Play Date Cafe Color combo. This week was an interesting combo of Blueberry, Dusty Pink and Cream. I decided to use a doily design...seems like that is a trendy thing as of now. Using Memento Paris Dusk ink, I stamped a GKD stamp from "Nana's Needlework" by Nina on Pink CS . 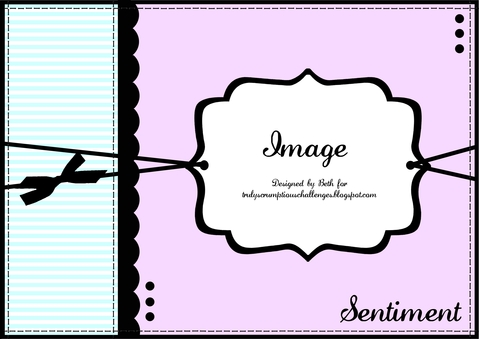 Cut this out with Nestie Circle and placed on Scallop Circle of blue CS. I added some glitter with Sakura Clear Star pen to highlight the design but does not show in photo. Imagine you see it anyway. Embossed pink cs with CB EF Swiss dots and punched edge with MS border punch and corners with EK Success punch. Placed on Cream Card Base. Added ribbon, sentiment, and "Blueberry" Gems. I have made several cards with the Paper Cupcakes image "Beached Boat" by Nina and it is one of my husband's favorites. I wondered if I could make a moonscape using this image and set about to do so. After printing the digital image on white CS, I colored it using Copics C1,3,9, BV 23,25,29, and W1 leaving the sky blank. I then used a versamark pen on all the design including the bird and embossed with clear EP. I then stamped in some "sea grass" with versamark using an Annabelle stamp from "All Things Grow". I heat embossed the grass with Black EP. I cut a circle with Nesties die and used it as a mask over the boat and sponged in the sky with Memento Paris Dusk and SU Night of Navy. Sponged some Memento Tuxedo Black around edges of sky. Removed mask and sponged some streaks of blue over the moon. I trimmed the scene and placed on a Silver Metallic mat and on to a card base of Black CS. Added some metallic stars from some confetti that I had. Stamped the GKD Sentiment "Happy Father's Day" with versamark on white CS and heat embossed with Silver EP. Sponged with the blue inks and then cut with Nesties small oval die. This finished my Moonscape Father's Day card. This was a card that I wasn't sure how it would turn out but I was pleased with the first try. Next time, I will try to improve the sponging of the sky. When I finished, I realized that this will meet several challenges out there this week. There's Magic in The Air: This was the challenge that I had in mind as I worked. The challenge was to make anything male/masculine in a card. Of course I used the Paper Cupcakes image. Cards For Men: Blue and Black is the color combo. Just happens that I used those colors. 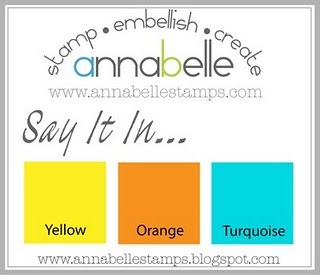 Annabelle Stamps: Say it with Masking and Sponging...must have been thinking of this challenges as I worked. Did not start out as an entry for this challenge but certainly fits. Even used an Annabelle stamp. Digital Tuesday: In the garden or outdoors. Alphabet Challenge: F is for Father's Day. PaperPlay Challenge: Father's Day/Male card. Crazy 4 Challenges: Make a masculine card. 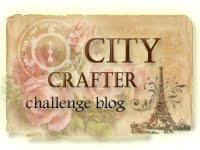 Saturday Secret Crafter Challenge: Make a male card. Sentimental Sunday: Father's Day or Masculine Card with a sentiment. Stamptacular Sunday: Challenge is Dads or Grads. It took me longer to list the challenges than it did to make the card. This was a difficult card to photograph...so many reflections...this was the best I could do after several tries. It is really better in real life, trust me. 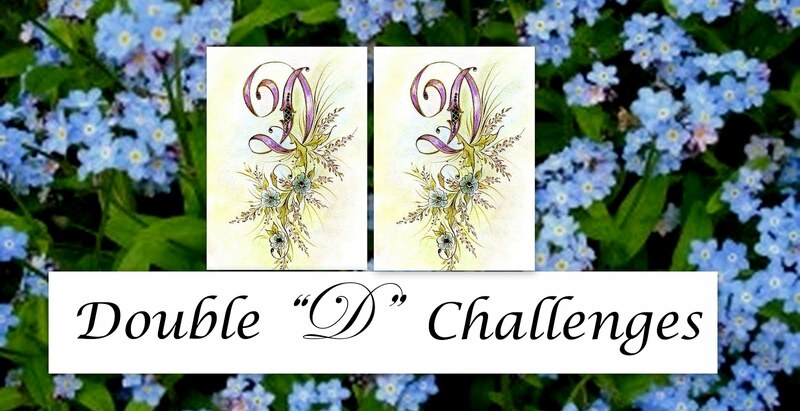 And Yet Another Flourishes Challenge! 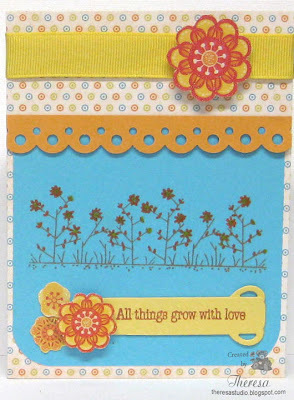 Flourishes is having a fantastic release this week of new stamp sets that are just wonderful. Check here. Each day of the sneak peeks has been better and better. You must go by their blog and check it out. 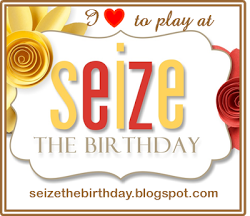 They have some wonderful challenges and a blog hop going on too, but hurry the time is running out. I am doing everything I can to be in the running to win one of their prizes including this card for the "Pretty in Pink" Challenge. Why am I sharing this information...it will only increase the competition? But I want everyone to have these great stamps. If I do not win, I will have the sets on my wish list. Best one of all is a vegetable stamp set for using for recipes, etc. No, this is not a paid advertisement but I really like these stamps. I had to make a card by using this palette as inspiration. My entry: I used the Flourishes Stamp "Lenten Rose"...have had this for awhile and this is my first time to use...colored image with Copics G20,21,82, R81,83,85, YG03 and Sakura Yellow Glaze pen for center of roses. Cut out with Nesties Oval (Note how leaves extend beyond oval) and matted on Pink Scalloped Oval. Placed this on a Lace Patterned DP with punched rounded corners and edges sponged with Angel Pink Ink. Adhered to Bazzill Light Pink Card base. Finished with bow of Pretty Pink. Wish me luck....I really, really want to win!